Everyone seems to have different methods and tricks they use to stay organized. Some, of course, are more effective than others. One person’s method that everyone seems to want to try these days is Marie Kondo’s, author of The Life-Changing Magic of Tidying Up. 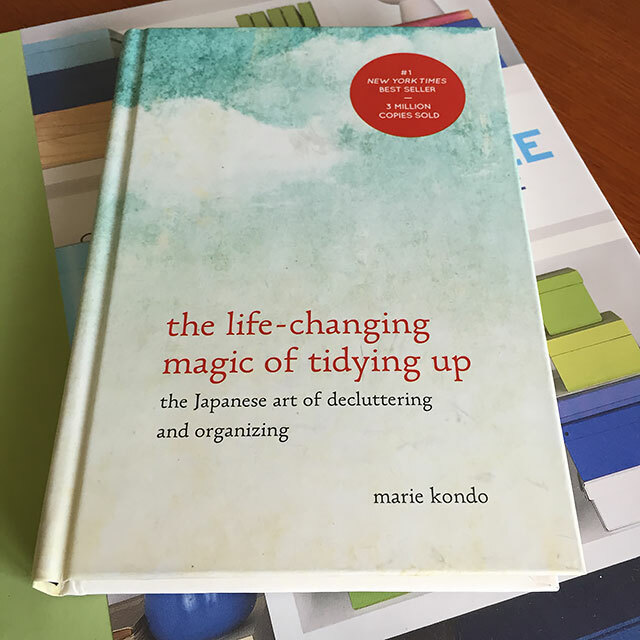 This book, which was published in 2014 and quickly became an international bestseller, shares Kondo’s unusual method for decluttering. I say unusual because it isn’t a tactic most people would think to try without having read the book first. Rarely, if at all, do we spend time considering whether our belongings make us happy. But doing so can help you transform your home, according to Kondo. If you are surrounded only by what makes you happy, rather than items that you feel obligated to keep for one reason or another, you become more appreciative of your environment. Kondo also doesn’t believe in decluttering a little every day. Her method for organizing is meant to be a one-time process, making it a solution rather than just a band-aid to your organizational problems. Now you’re probably wondering if it’s even possible to have household items that spark joy. The answer is no. Marie Kondo does expand on her strategy to also include necessary belongings, such as important documents you have to keep. The point of this book, however, is to clear out all of those books, accessories, bathroom and kitchen products you don’t need and really don’t even want. Once you do this, you’ll find you have a much more relaxed and organized home. If you’re in need of a new method for organizing, try Kondo’s. Surrounding yourself only with stuff that makes you happy is an easy way to design a space you love coming home to.